Indian Railways’ fastest engine-less train – the Vande Bharat Express – also known as Train 18, is all set to be flagged off in the coming days by PM Narendra Modi on the Delhi-Varanasi route. The Vande Bharat Express will cover the distance between Delhi and Varanasi in 8 hours, stopping at only two stations – Kanpur and Prayagraj. Sources told that the schedule and fares of Vande Bharat Express are awaiting final clearance from Railway Minister Piyush Goyal. Under the proposed schedule of Vande Bharat Express, Train 18 will depart from Delhi at 6:00 AM to reach Varanasi at 2:00 PM. Enroute, it will halt on the Kanpur station at 10:20 AM and Prayagraj (formerly Allahabad) at 12:25 PM. On the return journey, the Vande Bharat Express will leave from Varanasi at 3:00 PM to arrive in Delhi at 11:00 PM. On the way, it will stop at Prayagraj at 4:35 PM and Kanpur at 6:30 PM. Vande Bharat Express will run for five days a week – Tuesday, Wednesday, Friday, Saturday and Sunday. On Monday and Thursday, the new self-propelled train will undergo maintenance. Train 18 has been named the Vande Bharat Express in recognition of the “vandaniya” work done by Indian Railways. The ‘Make in India’ Vande Bharat Express has been designed and developed in a record time of 18 months by ICF Chennai at a cost of Rs 97 crore. According to Indian Railways, with economies of scale, the manufacturing cost will be half that of a comparable import. 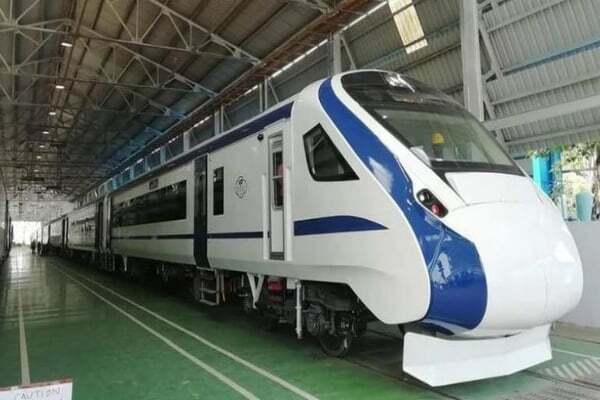 Given the world-class standards of the engine-less Vande Bharat Express and its cost advantage, the Train 18 set has already generated export interest from several countries. The 16-coach all air-conditioned Vande Bharat Express will have both Executive and non-Executive chair cars. The fares of Vande Bharat Express are expected to be around 40-50% higher than the base fare of Shatabdi Express. Sources told that if the fares are set higher than Shatabdi Express, then flex-fare will not be applicable on the new Vande Bharat Express.